He was about to begin his talk when the lights suddenly went on again. Professor Wayne Knox, the Director of the Institute of Optics, rose from the front row of seats, smiled broadly, and told a startled Professor Wolf that he had a surprise for the distinguished faculty member. And then, Department Chair and Lee A. DuBridge Professor of Physics (and Professor of Optics) Nick Bigelow rose from his seat, smiled just as broadly, and joined the two professors by the podium. 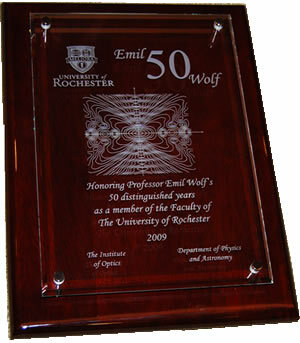 On behalf of both the Department of Physics and the Institute of Optics, Knox presented Emil Wolf with a plaque to honor his 50 years as a University of Rochester faculty member. Both he and Bigelow congratulated Professor Wolf and thanked him for his long and very distinguished career at the University. 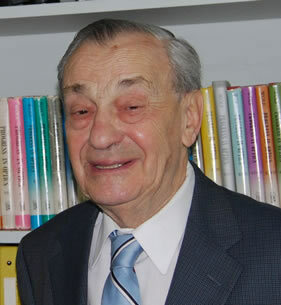 Among all of his many publications, Professor Wolf is perhaps most well known for his classic book Principles of Optics: Electromagnetic Theory of Propagation, Interference and Diffraction of Light, which he wrote with Nobel Laureate Max Born. This book was first published in 1959 and is now in its seventh edition, which was published by Cambridge University Press in 1999. 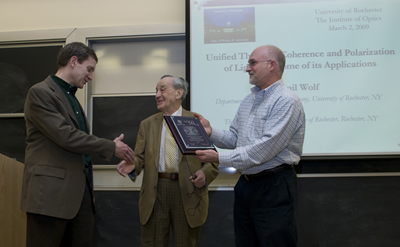 Wolf recently won the 2008 Joseph W. Goodman Book Writing Award presented by the Optical Society of America (OSA) and the International Society for Optical Engineering (SPIE). His winning book is Introduction to the Theory of Coherence and Polarization of Light, which was published in September 2007 from Cambridge University Press. He is the author of 423 scientific papers. Professors Knox and Bigelow told a few short anecdotes about their early experiences with Professor Wolf, much to the amusement of the audience, which was now packed in all seats of Sloan, as well as in the aisles and across the floor in the front. And then the lights dimmed once again, and the renowned and remarkable Professor Emil Wolf began speaking to yet another generation about the theories of coherence and polarization of light.